Turn photo memories into stellar gifts. Searching for the right present for your little one’s birthday can be stressful. I always find that a gift incorporating meaningful photos is a fun and thoughtful way to say, “I love you.” You’d be surprised at the reaction you get from children. Sometimes they appreciate the sentiment as much as an adult would. Take a look at six photo gift ideas that are sure to be perfect for the birthday honoree. Master a wall collage. Be it with a poster of a favorite band, or sports trophies, kids love to decorate their rooms. Create a fun birthday memory by printing out pictures of your child’s friends, family vacations, and other special occasions and creating a master photo collage on his bedroom wall. Another way to display the mixture of snapshots is to cut out large letters that spell your child’s name and arrange the photos on each letter. Showcase your creation on the bedroom door or wall. You’ll be making more memories while reflecting on old ones, and it makes for easy (and inexpensive) bedroom decor. Create a photo quilt. There are few things young kids love more than a comfortable item. As such, parents with younger children can score birthday points by incorporating photos onto a cozy blanket. Print or iron photos onto individual, 5-by-7-inch pieces of fabric. Then put your sewing skills to work by designing a homemade quilt. The end result is a one-of-a-kind blanket your little one can cherish forever. Write a short story featuring your child. There is nothing better than story time with your child except if your child were in the plot line! Sites like www.flattenme.com feature your child as the main character through the use of personal photos. Upload a picture of your little one and then pick the book in which you want him to star. Just be prepared to read it over and over again. Get a kid-friendly camera. An obvious way to foster a passion for photography in your child is to get him clicking away at an early age. And forget about disposable cameras. Kids are more in sync with technology than ever before. Don’t skimp on the digital camera. Brands such as Fisher-Price and Disney make kid-friendly (and damage-proof) models. Before you know it, your child will be making his or her own social media memories! A book of the day he was born. Show me a child that doesn’t like to hear stories about himself, and I will show you a mom who doesn’t like good deals. Kids like to hear tidbits about when they were babies. 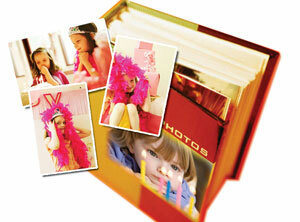 Create a Moxybook scrapbook of all of your social media interactions from the day your tyke was born. The birthday child will love seeing his newborn pictures and comments left by family and friends. Plan for a book of birthdays. This gift requires more planning and time than the rest of the ideas. However, it’s a money saver and offers tons of meaning to your child when gifted. Every birthday starting from a young age, take a picture of your son or daughter. With it, log answers to a slew of questions to be asked yearly. They can include topics like that year’s favorite activities, dreams, goals, and so on. Secretly keep these details in a scrapbook and then present the final creation on his 18th birthday. The two of you can spend time looking through each birthday and reflecting on all of the memories shared together throughout his childhood.